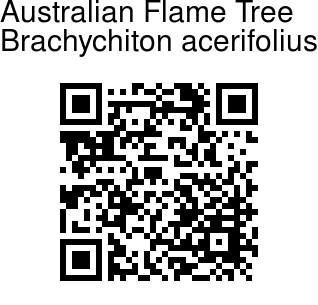 Australian Flame Tree is a large tree native to subtropical regions on the east coast of Australia. 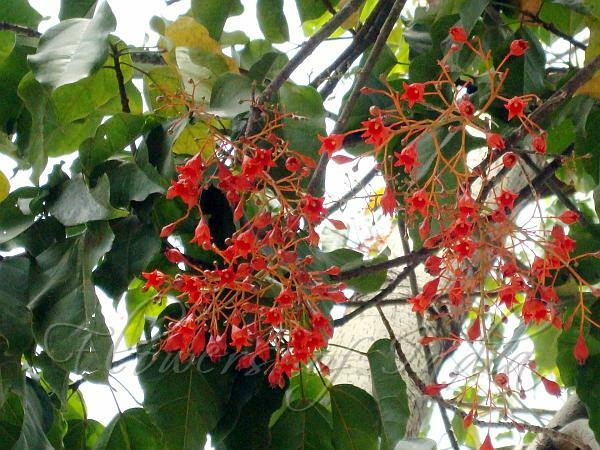 It is famous for the bright red bell-shaped flowers that often cover the whole tree when it is leafless. This tree is tolerant of temperate climates and is now cultivated world-over for its beauty. However, the maximum height of 40 m is reached only in the original, warmer, habitat. It usually grows to be about 20 m. Leaves are variable, either entire or with 5-7 deep lobes. It sheds its leaves after the dry season. The spectacular flowering occurs in late spring and new foliage is ready for the summer rains. In areas where the winter is not particularly dry, this natural rhythm may become somewhat erratic and the tree may flower only partially. Flowers are scarlet bells with 5 partially fused petals. The pod-like fruits are dark brown, wide, boat-shaped and about 10 cm long. They contain masses of thin bristles that stick in the skin, as well as yellow seeds. These are nutritious and were eaten by Aborigines after toasting. Photographed in Forest Research Institute, Dehradun.